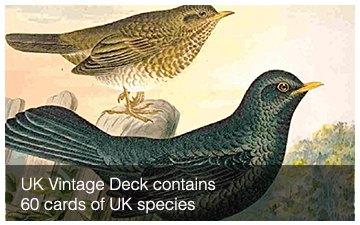 This 60 card Starter deck collects UK organisms illustrated with vintage pre-1913 illustrations. Images are from wiki commons or from the Biodiversity Heritage Library. Please let us know if any copyright error has been found. This is a DIY 60 card STARTER deck that collects vintage biodiversity related illustrations that predate 1913 (at least one hundred years old). Most come from wiki commons or the Biodiversity Heritage Library, where copyright status appears clear. Note that if an image used are breaking copyright status, please contact db@mail.ubc.ca so that we can remove the image. All organisms collected depict common flora and fauna found in the United Kingdom. Note that revenue neutral purchasable decks are also available. Costs only go towards printing and shipping.